Singer, Songwriter, Author of Facing The Music Jennifer Knapp. Free event sponsored by Social Work Dept. An evening of fascinating, behind-the-scenes stories from a Buffalo State graduate who has worked at the highest levels of government with the biggest names in American politics. Buffalo State's 143rd Commencement celebration. Morning ceremony begins at 10:00 a.m. Afternoon ceremony begins at 2:00 p.m.
Evening master's/C.A.S. ceremony begins at 6:00 p.m.
Jim Zorn of Doolli will be available to assist faculty members entering their annual reports via the Doolli platform. This is a walk-in session for faculty, chairs, and secretaries who need help entering and using the faculty annual report on Doolli. This is a walk-in help session for faculty, chairs, and secretaries who need help entering and using the faculty annual report on Doolli. You've been here a month. Now what? In this roundtable discussion, new faculty are asked to share their thoughts and experiences on their first month at Buffalo State. The Buffalo State community will usher in a new academic year and welcome the Class of 2020 during the First-Year Convocation. All members of the Buffalo State community are encouraged to attend. Join the International Education Office, along with other SUNY campus representatives, to learn about study abroad and exchange opportunities. 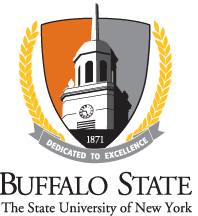 The annual Faculty and Staff Recognition Ceremony honors recipients of Buffalo State President's Awards for Excellence and SUNY Chancellor's Awards for Excellence. In addition, new faculty and staff and recipients of significant grants and awards will be recognized in the program. The 2016 Summit on College Students features a panel of experts in higher education who will be sharing their insights and expertise on crises, opportunies, and solutions related to college students today. Starting October 1, registration is $35. Students with valid student ID are free. Wine and cheese reception and working meeting. RSVP by December 21. The Undergraduate Summer Research Fellowship (USRF) program supports eight weeks of full-time research, scholarly, and creative activities for Buffalo State students with a graduation date of December 2017 or later. Honors Convocation is an annual event recognizing Buffalo State students who have a GPA of 3.5 or higher with the required number of credit hours. Special celebration for seniors graduating with baccalaureate degrees. Brief preview of what to expect on commencement day and how to plan. Festive celebration with light refreshments, celebratory toast, Buffalo State memento, festivities. All Buffalo State students are invited to attend this semester’s Student Open Forum, hosted by President Conway-Turner. This event empowers students to share their opinions, ask questions, and engage with the president and her cabinet. Buffalo State's 147th Commencement celebrating December 2018 and January 2019 graduates and May 2019 and August 2019 degree candidates. Guests: Doors open at 4:00 p.m. Guest tickets required for all entrants.